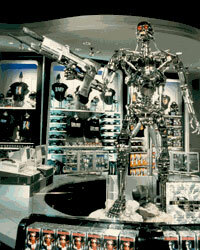 Located in the Hollywood section of Universal Studios, this shop offers clothing and gifts featuring the Terminator. The exit of Terminator 2 3D also lets out right into the shop. A 7-foot-tall Endoskeleton-head is featured in the store window. In the evenings, when it's dark, its eyes are lit up. Featured in the center of the store is a 1:1 replica of the T-800 Endoskeleton. Also included inside the store is Terminator 2 3D Wardrobe on display.